“Hakuoki: Stories of the Shinsengumi is an interesting, unique gaming experience that will either immediately be charming to gamers, or tedious.” Find out why in our full review! There are times when you may want to play a video game, others when you may want to read a book, and there are even the weirder moments where you feel like mashing these two acts into one bizarre marriage. For those people that find themselves falling into the latter of these categories, then Hakuoki: Stories of the Shinsengumi may be exactly what you’re looking for. 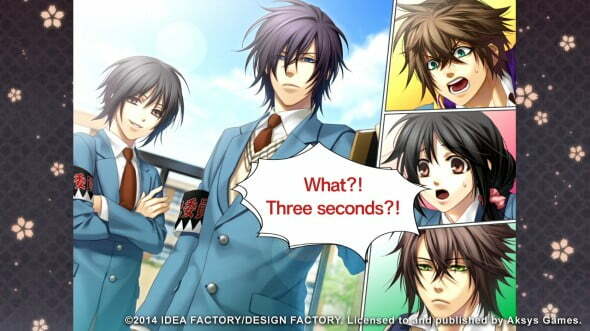 Hakuoki is a game that falls into the peculiar, tiny genre of “visual novels,” where you’re navigating through an extremely text-heavy “game” (tremendously so even, seriously, like 95 percent of your gaming experience will be spent reading text and looking at minimally animated backgrounds). There are a few moments here (and truly, a “few”; like three or four), where you’re presented with a decision to make, and while this decision obviously affects the outcome of the rest of the game, these minor dalliances with decision-making shouldn’t be confused with actually “playing” a video game. Hakuoki was originally a port of a PSP title (with there also being a 3DS version), and that’s not at all surprising to hear, as the pick-up-and-go, mobile aspect here would add much to the title (you know, like an actual book), rather than forcing you to sit down and confine yourself to the experience. This title moves so fluidly, and being able to go through a few “chapters” when you’re on the move would have made this a more symbiotic experience. Getting into the layers of Hakuoki, the variety of visual novel at play here is an otome; a romance story, and this one takes the form of a peculiar 19th century reverse harem love tale that sees a woman being pursued by male suitors. In this case, those being the ronin-esque samurai military, after she witnesses them having a fight. The woman is kidnapped, but her life’s spared because her father is a doctor (natch). As you can probably gather, this is an incredibly niche topic, especially when removed from Japan. Inside of this title though is a beautifully told story with rich, deep, fully fleshed out characters that feel as genuine as those you’d find in an actual novel, that resonate deeply. You’ll find them all invading your brain long after shutting off the game, as the story here is full of red herrings, twists, and becomes a real page-turner, so to speak. One of the smartest things that Hakuoki does is using such a brisk pace to fly through this story. 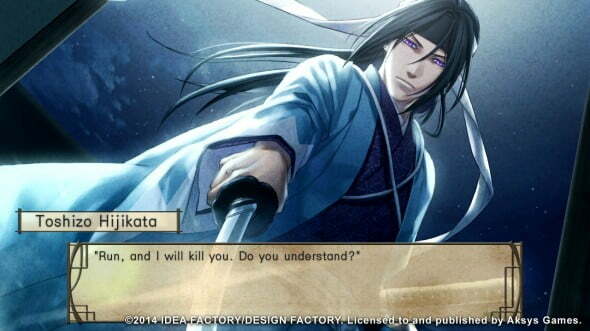 Something like this is absolutely crucial for a game of this genre, and Hakuoki knows this. Aesthetically, art design and presentation are beautifully and meticulously assembled providing you a stunning accompaniment to your novel-like experience. The story is presented in the first person perspective, which not only looks attractive design-wise, but it’s also a very smart way to help immerse yourself in the character and really getting yourself lost in this “novel.” Granted, none of this is pushing the PS3’s limits, but they still do more with their power than they need to for a game like this. That being said, backgrounds are reused often, which can pull you out of the story, which is death in something like this. Similarly, Hakuoki presents to you a very nice soundtrack, but it’s tiny, and here too will you be going through many reused backing tracks. Feels like a pretty serious boss fight/end of the chapter! Credit should also be given to Aksys in the first place for even attempting to localize this game, not only in response to the assumedly small fan base for this genre, but also because of the sheer ton of text that needs to be translated and sorted out. 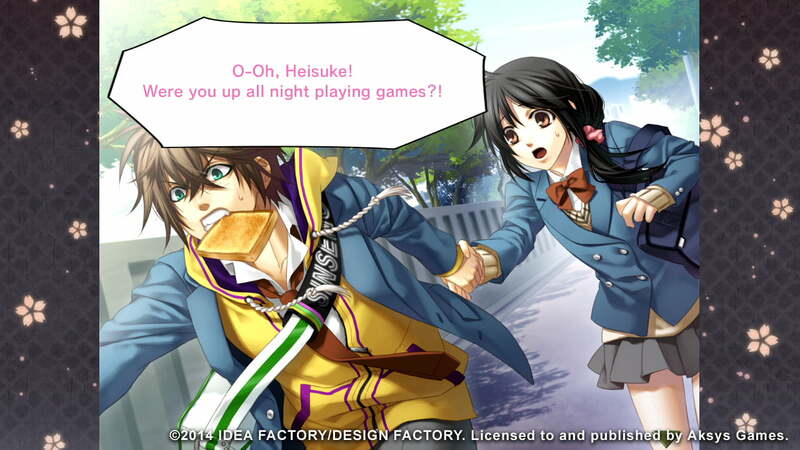 It’s a real feet of will, and Aksys pulls it off with aplomb. You don’t need to worry about missing out on anything from the original either. Another nice touch, which even adds a degree of replayability to Hakuoki is the fact that there are different endings and romances to unlock due to the (limited) choices you get to make. While this addition is certainly nice, honestly, your first playthrough of this game is this game at its best, and it seems unlikely that many will go through it all again. Not only that, but picking other options to acquire different endings inevitably means you’re picking your back-up choices here, leaving all of this with a very forced, unnatural feeling, unlike your original playthrough. Just some of the believable characters you’ll get to hang out with in this book game adventure! After playing through this, there should be absolutely no disputing that this game is undoubtedly well told and presented, and if you are into visual novels and other games of this ilk, you’ll no question like this game. All of this essentially comes down to whether you even consider this to be a video game. If you do, Hakuoki is visual storytelling at some of its finest, but if you think this sounds like a boring, restless non-experience, then you’re not going to end up surprising yourself here either. Hakuoki: Stories of the Shinsengumi is an interesting, unique gaming experience that will either immediately be charming to gamers, or tedious. The presentation of this visual novel excels in terms of its graphics and art design, story pacing, and deep, rich character and story work, not to mention being an ambitious localization project in the first place. In spite of all of this though, recycled game assets, lacking audio, and the title’s controversial game style itself may be enough to dissuade gamers from the experience entirely.